Root Change has partnered with Children International and their 13 country agencies to clearly identify challenges facing their communities and test solutions using lean experimentation and design thinking. Local staff have been testing rapid, low-cost organizational changes in areas such as internal communication, partnership development, as well experiments related to child wellbeing. Worldwide, over 50 experiments are currently being tested in two-month long sprints. Children International, which has worked in child sponsorship for over four decades, recently launched a new global strategy centered around making investments in health, education, empowerment, and employment in their sponsored families. With 13 local offices working with communities in 10 different countries, CI needed to develop ways to understand and respond to the range of socioeconomic conditions in each unique context. In a move to flatten the organization and empower the people closest to the community, CI invested in developing local staff’s skills to design programs and processes that respond to the needs and opportunities of their sponsored communities. To quickly spread this problem solving skill set across the organization, the CI+ capacity building initiative has been introducing lean experimentsas a process to quickly test ideas and iterate on lessons learned during short activities to test hypotheses. Lean experimentation as a way for cross-department teams to design and test pilots has not only produced solutions fitted to an experiment team’s context, but has also increased demand for skills in adaptation and community engagement. 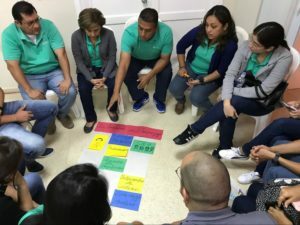 Since introducing the lean experiment initiative in late 2016, teams have conducted dozens of experiments ranging from family cooking lessons to improve nutritional outcomes for undernourished children in Manila, to engaging parents in their children’s reading clubs in Colombia, to involving volunteer coaches to train youth facilitators in teaching and class management in Guayaquil. Challenging traditional thinking on strategy and planning, lean experimentation has the potential to change how and by whom decisions are made in the social change sector.A growing movement within international development and philanthropy is questioning assumptions about the effectiveness of centralized decision making in producing significant and lasting improvements in recipient communities. In our work supporting Children International’s transition to locally-led and community-oriented programming, we’ve found lean experimentation effective in developing staff’s critical thinking skills and ability to engage with sponsored youth as partners. 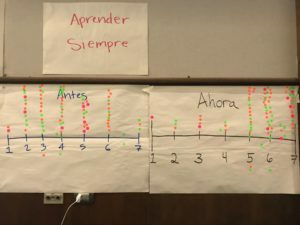 In an unscientific measure, CI staff in Guayaquil reported an increase in learning in the agency over the past year. With an emphasis on building the skills to question assumptions, test ideas, and iterate on lessons, lean experiments are developing staff capacity while establishing new learning processes throughout the organization. With experiment teams made up of staff from across a local country office, the process has helped increase risk tolerance, foster relationships and solutions across departments and programs, and make connections among the various functions of the organization. Guayaquil staff reflect on changes in their empowerment programming. In July, 81 staff members of the Guayaquil agency met for two days to review a year of experimentation and change. People reflected on the evolution of their organization over the past year and shared lessons from the various experiments. Experimentation hadn’t solved everything, and lingering issues like internal communication and partnership sparked debates, but nearly everyone reported some degree of positive change toward more open, collaborative work. With many of the past year’s lean experiments focused on involving youth and parents in more decisions, staff reported they felt much more connected to the community and mission of the organization. And while the agency faces obstacles in formalizing and sustaining this new culture, they’re continuing to experiment their way toward becoming a learning organization. As local agencies facilitate their own capacity development through action learning, new and unexpected abilities, passions, and leaders have begun to emerge around the world.